Well, it has officially begun! Winter Bites Culinary Week is underway and I’ve made sure to set out my eating schedule for the week. Rino’s Kitchen was the place for the first lunch of the week. Partly because Rino’s Kitchen agreed to take part in an exciting initiative that is taking place during Winter Bites Culinary Week….and mostly because it’s one of my favourite lunch spots. As part of their menu, Rino is using a fruit that once flourished in southern Ontario and is now part of a project to reintroduce it into the region. Project Pawpaw is an initiative of the Naturalized Habitat Network dedicated to raising awareness of the indigenous Pawpaw and its benefits by providing education, training and practical experiences to both prospective producers and consumers, with the goal of restoring this species, while establishing it as a community supported, environmentally sustainable local food resource. Program Coordinator, Dan Bissonnette, has teamed up with Windsor Eats during Winter Bites to educate consumers about his efforts to reintroduce the edible Pawpaw fruit to the region. We challenged a few of the participating restaurants to use the Pawpaw on their culinary week menu. Rino Bortolin of Rino’s Kitchen is a proud supporter of using locally produced ingredients in his kitchen. So it came as no surprise when he took up the challenge of using the Pawpaw. 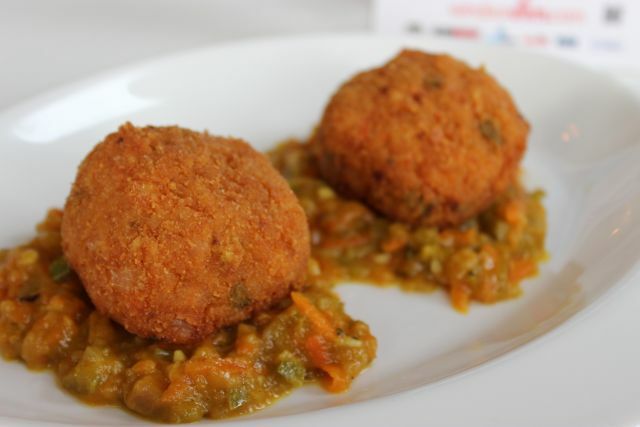 Rino created a pawpaw and rhubarb chutney that he paired with Indian spiced rice balls. So what does a pawpaw taste like? Rino describes it as a cross between a papaya and a banana with an earthy aftertaste to it. I definitely tasted the earthy tones in the chutney but my tastebuds narrowed in on the rhubarb (most likely because of my current weird obsession with rhubarb). Overall the Indian spiced fried rice paired well with the chutney and if you head to Rino’s for lunch, I suggest giving it a try. That was my first course. I chose a grilled salami panini as my second and after devouring the rice and chutney, only had room in my tummy for 1/2 a panini. Something Sean was grateful for later in the day, as I brought him the left over panini and half eaten dessert of lemon poppy seed cake. 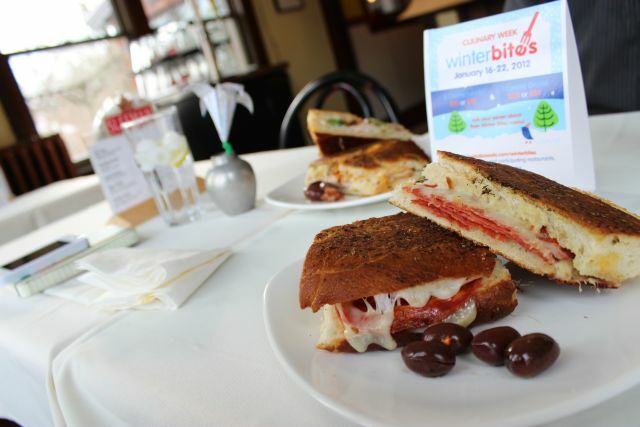 Let us know about your Winter Bites Culinary Week adventures! 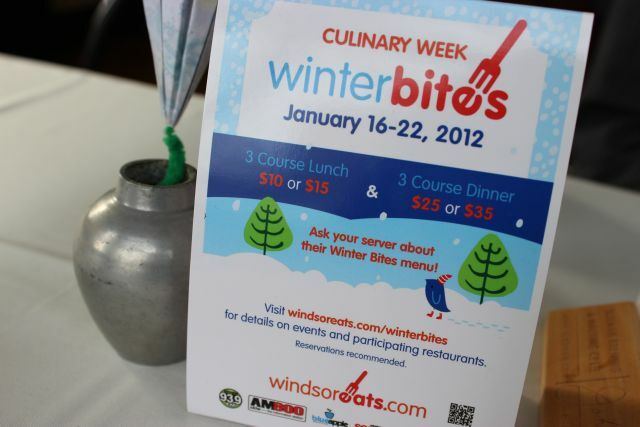 Follow us on Twitter and use the #winterbites hashtag or post your photos on our WindsorEats FaceBook page. We’d love to see what you’re eating!